Albert William Hawker was born in Gloucester, the son of a domestic coachman, and grew up at 59, Southgate Street. Starting his rugby with the Gordon Wanderers, Bert, a forward, progressed through the Post Office and Gloucester Thursday sides into the City Club. Turning out for the “A” side initially, he scored tries in successive games against Stroud “A” on 31st December 1898 and Berkeley and Sharpness on 7th January 1899. Later in the season he scored again for the “A” side against Swindon, but by then he had broken through into occasional appearances for the First XV. Bert played his first game for the Gloucester 1st XV away at Exeter on 11th February 1899, a match won 4-0 by Gloucester thanks to a dropped goal by Percy Stout. Bert made four further first team appearances before the end of that season, and led WB to comment in the Citizen “A Hawker is a youngster who should be heard of in the future”. Bert lived up to this early promise, and became a regular in the side the following season, 1899-00, when he appeared in 24 of the 32 matches played, during which Gloucester, under the captaincy of Walter Taylor, remained unbeaten by any English club. He scored his first try for the 1st XV at Bath on 18th November 1899, when Gloucester won 20-0 in a match described as “a very scrappy game, which Glo’ster should have won 40-0”. Later in the season he scored further tries against Clifton, Leicester and Penarth. Towards the end of the season, Bert was in the Gloucester side which took on the Barbarians for the first time at Kingsholm at the start of their Easter tour. The match was arranged to provide a boost to Club funds following the huge loss made by staging the England v Wales international three months earlier, but, played on a rainy Thursday, receipts amounted to only £35. However, it did result in a fine win, 13-0, for Gloucester, and Bert got a mention in the match report – “Hawker brought relief to the home team with a big punt”. In 1900-01, Bert played in 26 of Gloucester’s 34 fixtures under a new captain, George Romans, and the team enjoyed another successful season, losing only 5 games. Indeed, for the first time, the Club went through a complete season without suffering defeat at Kingsholm. Bert not only contributed wholeheartedly in a good pack of forwards, but continued to pitch in an occasional try, scoring against Bristol, Treorchy, Bath and Clifton. By now, Bert was sufficiently well established to be referred to by WB in the Citizen as “of the older members (of the pack) …. and A Hawker have retained their form”. Bert broke through into the County side during this season, winning his first cap for Gloucestershire against Devon at Exeter on 1st December 1900, and then appearing in both their friendly matches, home and away, against Glamorgan. In 1901-02, Bert’s form seems to have dipped, and he made only 4 appearances. At the end of the season, WB refers to him as “among the reserves…other players assisting occasionally being A Hawker…”. 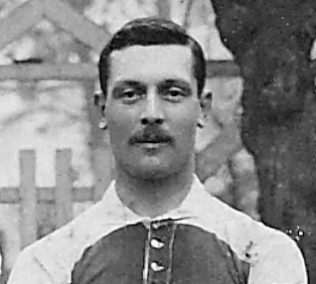 Bert forced his way back into the team in 1902-03, when he appeared in 16 games, almost half of the fixtures played in a disappointing season for the team. The ups and downs of his season included being sent off in the match at Cardiff, and scoring a try against Bridgwater. WB summarised it as “of the other old hands, … A Hawker did well”. 1903-04 saw a complete restoration to the team for Bert, with 27 appearances in the 34 matches played, although Gloucester struggled through the season with 18 wins and 14 losses. He scored tries against Clifton and Richmond, and won back his place in the Gloucestershire side, gaining caps against Somerset and Cornwall as one of only 3 Gloucester players in each match. Speaking of the pack at the end of the season, WB wrote: “Parham was entrusted with the leadership of the front division, and with Goulding, Hawker and G H Smith, formed a strong quartette”. Bert had the busiest season of his career in 1904-05, playing in 33 of the Club’s 36 fixtures. The team’s results also showed a marked improvement with 23 wins against 11 losses, and they won the CountyCup, beating Bristol 12-0 in the Final, as a result of which Bert and his teammates were presented with gold medals. Bert scored his only two tries of the season on successive days – against Old Merchant Taylors on Boxing Day, and against London Welsh on 27th December. WB summed up Bert’s season with – “Hawker showed better form than ever”. Perhaps the highlight of Bert’s playing career came on 19th October 1905, when he played for Gloucester against New Zealand at Kingsholm. The match was hard going for the Gloucester team as a whole, but for Bert and the rest of the pack in particular, because Gloucester chose to play only 7 forwards in order to allow them to play 3 half-backs. The plan failed, and the All Blacks delivered a crushing 44-0 victory. It is interesting to note that Bert, a forward, is complimented in the match report for some fine kicks to restart the game – he had plenty of practice! – (although he kicked straight into touch at the start of the second half). Bert’s last season playing regularly for the 1st XV was 1906-07, when he appeared in 24 of the 34 fixtures. He scored his last try against Exeter at Kingsholm in a 16-0 victory on 19th January 1907. WB noted that “A Hawker … of the old brigade, rendered signal service”. The following season, Bert made only a solitary appearance, although he came back to play his last six games in the 1908-09 season, his very last being at Coventry on 30th January 1909, almost exactly ten years after his first. Bert’s career record for Gloucester was: played 198 games, scored 17 tries and one dropped goal, making 55 points. Amazing – Albert played in the 1905 game v the All Blacks in which my grandad Ernie Hall played – but Albert also played in 1900 with my grandad’s 2 elder brothers Charlie and George Hall.